Alaska Airlines is being challenged by Delta Air Lines; the Port would like to offload some older cranes; a rundown of the many downtown construction projects looking for buyers. Seattle-Tacoma International Airport is busting at the seams, with this region’s economic boom and an airline war between Delta Air Lines and Alaska Airlines fueling record-setting passenger traffic. In June, ahead of the late summer peak, Sea-Tac for the first time surpassed 4 million passengers in a single month. And after roaring growth of 7.7 percent last year, so far in 2015 passenger traffic is up a stunning 13.1 percent. It’s a challenge to handle that kind of growth. So far this year, international passengers arriving at Sea-Tac have on 393 occasions had an extended wait to enter the country, held either on board the plane or in the corridors of the crowded arrivals terminal. A report published this week by OAG — formerly Official Airline Guide, a U.K.-based aviation data analysis firm that provides flight information to airlines worldwide — the report tags Sea-Tac as the fastest-growing airport among the top 20 in the U.S.
Alaska Airlines is the largest carrier at Sea-Tac, but Delta Air Lines is narrowing the gap. A big factor in its growth is the rapid expansion by Delta, which is creating a major hub here as a gateway to Asia. The OAG analysis sharply illustrates the extent of Delta’s growth and its encroachment on hometown carrier Alaska Airlines’ business. 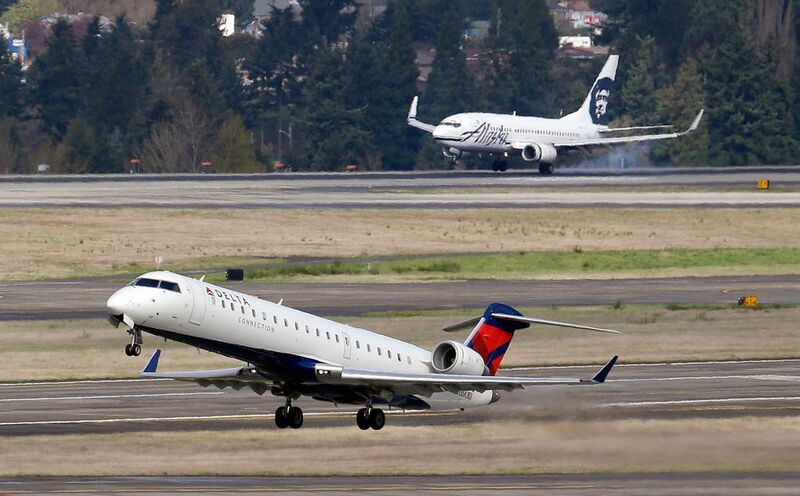 In the past year, Delta has increased the number of seats to and from Sea-Tac by 35 percent. Mike Medeiros, the Delta vice president assigned to develop the Seattle hub, said the airline is well ahead of schedule in its five-year plan to expand from 33 departures a day in 2013 up to 152 per day by 2017. This summer, the peak will be 129 Delta departures per day. Delta is now connecting 700 people a day from its domestic flights at Sea-Tac onto its international flights. “As we’ve grown the trans-Pacific gateway, it’s become very important for us to create our own domestic flow into Seattle,” Medeiros said. Medeiros added that Delta’s 3,000 local employees, along with the passenger traffic it brings to the region and the corporate philanthropy it has begun to dispense in the local community means the airline has become “an economic engine” for the region. “We are part of what makes Seattle a thriving economy,” he said. Alaska is also growing at a fast clip, with OAG citing its seats are up 11 percent in the past year, and it remains the largest carrier at Sea-Tac, with 46 percent of the seats. But Delta’s share has now risen to 21 percent, mostly at the expense of United, American, JetBlue, Virgin and Frontier, all of whom have cut capacity at Sea-Tac. And the OAG report shows how Delta has increased the pressure on Alaska Airlines by steadily moving in on its domestic routes. Delta now operates flights on 25 of the 78 routes currently flown by Alaska Airlines out of Sea-Tac, up from just 5 in 2012. Furthermore, Delta has aggressively stepped up competition on Alaska’s most important routes so that it now competes head-to-head on all but three of Alaska’s top 25 routes out of Sea-Tac. 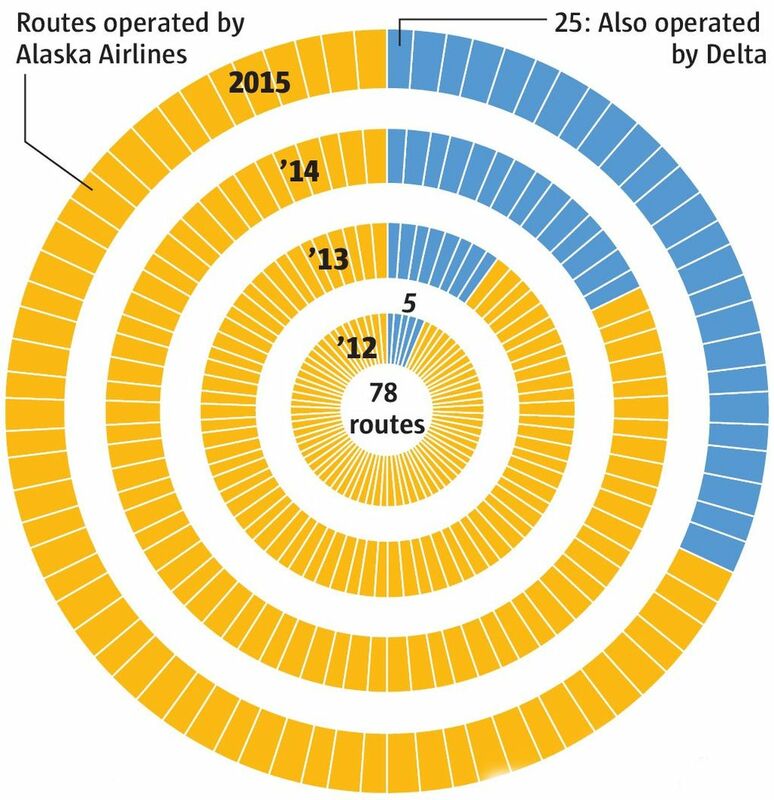 Alaska added six new routes out of Sea-Tac last year and will add seven this year. Airport managing director Reis said airlines have indeed begun to pull back capacity for the coming winter and so he expects the end-of-year growth rate for Sea-Tac to moderate from 13 percent down to about 11 percent. That’s still frantic expansion. Can Sea-Tac handle it? It’s already renovating and expanding the north satellite, planning a new International Arrivals Facility, a new high-speed baggage system and reconstructing the center runway. U.S. airports have asked Congress to increase the per-passenger tax they can levy, capped at $4.50 since 2000, to $8.50. That would provide funds for further expansion. Hey, buddy, wanna buy a cargo crane? For Sale: Seven outdated Imperial March-looking container cranes that have been guarding the cargo terminals in Elliott Bay since the ’80s. Make offer. These cranes vary in size but can accommodate cargo ships carrying between 2,000 and 6,000 20-foot containers (TEUs) hauled to and from the Seattle’s waterfront. The Port of Seattle is upgrading its terminals and these cranes are just too small to handle the newer, larger vessels that call the port every day, let alone vessels coming online that can carry 20,000 TEUs. While the Port becomes “big ship ready,” especially with the formation of The Northwest Seaport Alliance that is expected to be finalized in early August, other, smaller, ports could possibly use these cranes. Need a reference? Talk to The Port of Everett. The port to the north has two cranes it bought from Seattle back in 2005 to offload aerospace shipments and other cargoes, according to Lisa Lefeber, Port of Everett spokeswoman. Price is negotiable. The Port of Seattle is already in negotiations to sell three slightly larger cranes at Terminal 18 to SSA Marine, the terminal operator; the selling price is expected to be $1 a crane. That may sound like a steal, but the Port expects to pay $1.8 million to remove three other cranes coming down at Terminal 18. The seven cranes, six at Terminal 5 and one at Terminal 46 the Port is looking to sell have been advertised in trade journals but so far there has been limited interest and no offers. Without a buyer, it will cost the Port an estimated $4.7 million to get rid of them and they, like the Terminal 18 cranes scheduled for demolition in October, will mostly likely end up in a scrap yard. Speaking of cranes, 48 projects are under construction in downtown Seattle, 35 percent more than the previous peak in 2007-2009, according to a report released last week by the Downtown Seattle Association and the Metropolitan Improvement District. By June 2015, 106 construction projects were active (permitted, under construction or recently completed) in downtown Seattle. That is the highest count since the organizations began tracking in 2005. Thirty projects were completed in 2014. But, with 24 projects completed in the first six month of 2015 alone, and 36 scheduled for completion by the end of the year, downtown Seattle is on track to see the largest number of completed projects in the last decade, according to the report. Residential projects continue to dominate the construction landscape with 28 projects now under way, representing 6,428 units (5,552 apartments and 876 condos). This is nearly twice as many residential units under construction than in 2007 — the height of the previous development cycle. Seattle’s largest condominium development is the nearly completed $450 million Insignia Towers project at 2301 Sixth Ave. This will be the first major condo complex to open since 2009. The two towers will have 707 residential units over a base structure with 23,000 square feet of ground-floor retail, 1,000 parking stalls and a swimming pool. The downtown apartment market is on track to see 3,487 units delivered in 2015, more than any year since tracking began in 2005, according to the report. “The demand is strong for residential space in downtown Seattle, and residents and developers alike see the downtown neighborhoods as a terrific place to live,” Downtown Seattle Association CEO Jon Scholes said in a statement. Although residential projects continue to dominate, commercial projects are starting to see a surge — four times as much office space is under construction downtown compared with two years ago. As of June, 7.1 million square feet of office space was under construction. The wave of office construction includes Amazon.com with the Troy Block project and the Denny Triangle projects, which together will be 4.8 million square feet of office space, the report says. The Mark is a 43-story building that will have 14 floors for a 184-room SLS brand hotel and the other 28 floors will include 528,000 square feet of office space. After several years with no new development, the hotel space is beginning to grow again. In addition to The Mark, Stadium Place has a 278-room hotel under way and the First and Stewert Hotel and Apartments project will add 160 hotel rooms downtown when completed in 2016. Seventeen hotel projects are also in the earlier stages of development, the report says. The largest project in the pipeline, which will become the largest hotel in the Pacific Northwest, is the 1,270-room hotel/residential project by R.C. Hedreen in Denny Triangle. The report says the growth shows no signs of slowing down with companies like Amazon, Expedia, Facebook and Weyerhaeuser moving downtown or growing their downtown workforce.